Anthony Hamilton has said he can only improve after dismissing his victory in the first-round of the UK Championship as "rubbish". The Nottingham-born potter, who was once ranked number 10 in the world, faces former world champion Graeme Dott in the last 64 on Saturday evening. But he offered little hope about his chances of progressing after his 6-5 success against Craig Steadman. "It was rubbish - seriously. I can't play any worse," he told BBC Sport. "It was a good attitude but rubbish snooker. I am rubbish now a lot of the time." The 43-year-old turned professional in 1991 and has spent five years in the world's top 16 during his career. "You get fewer chances but the chances are better. I might be able to glean some old school form." 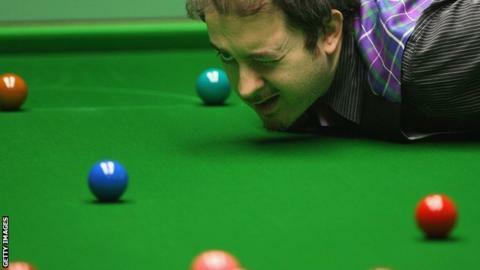 He has reached two ranking event finals, and played in four World Championship quarter-finals - the last coming in 2007. But Hamilton, who has been plagued by a neck injury in recent years, had slipped down the rankings to number 50 by the time the tournament got under way in York. "The tables are gorgeous," he added. "A few years ago I would have been making 80 every poke, now I am making eight every poke. "I am getting old basically. It's no fun but it's better than working." But despite his scathing self-assessment, Hamilton said it might suit him to face a player like Dott. "I will probably play better against a top player," he added. "They go for their shots, force the issue and if they miss they are in position so the chances come easier. "You get fewer chances but the chances are better. I might be able to glean some old school form. "It's simple mathematics; they are more attacking and that is perfect for me. "Graeme might be a bit too clever for me now I am old and rubbish. But if I play well then I have a chance, it's simple." One glimmer of hope for Hamilton, who now lives in Muswell Hill in London, is that he will not have a one-frame penalty as he did against Steadman. Hamilton waited in the wrong place before his match and was docked a frame for being late. "I came out of the dressing room and saw some players standing around waiting and just joined them," he said. "My lot were over the other side, but obviously I didn't know that. "I was only there a couple of minutes. By the time I got there I was late so I got docked a frame. "What can you do? It's my fault I suppose, but there was a lack of info. I didn't know we were going from two places. "But I got over it straight away and that was the only time I played well. I played well to start with but struggled in the second half of the match."